With loads of interactive exhibits to explore, you won’t know what to try first at Discovery! Be sure to look out for the whacky mirrors that make you look really strange, the echoing chamber that repeats your words a thousand times over and don’t forget to play a tune on the thong-a-phone! Mon-Fri 9am - 5pm . Bendigo Planetarium: Sit back, relax on a bean bag, and become immersed in the world above as we take you on a guided journey through the cosmos, venturing to places you’ve never been before. Each 20 minute show explores the wonders of astronomy and showcases the limitless phenomena in the sky above. Planetarium shows can be seen at 1:30pmTuesday – Friday and 11:30am and 1:30pm on weekends and school holidays. Vertical Slide: Discovery is famous for the southern hemisphere’s tallest Vertical Slide. 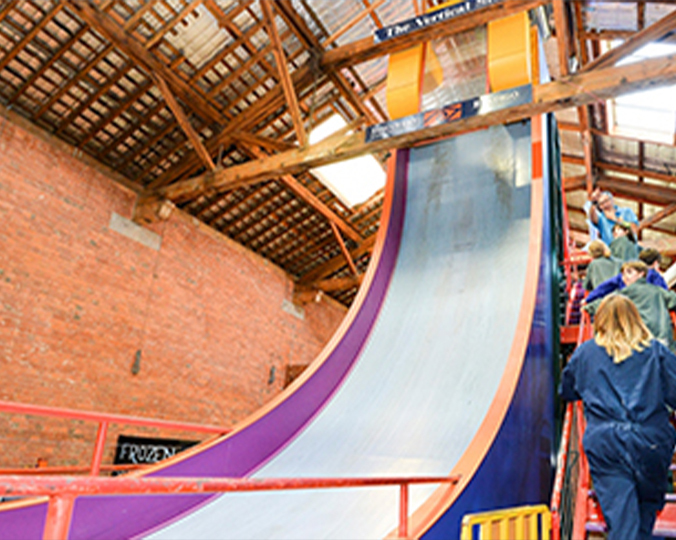 If you’re a thrill seeker, the Vertical Slide is definitely something that you will want to try. With a sheer drop of seven metres you will fall at a speed of 30-40km per hour! All sliders must be at least five years of age. You can plummet down the Vertical Slide at 11am, 1pm and 3pm. Kaleidoscope: Think you’re too young for science? Think again. For the young scientist under six, learn the basic principles of maths and science through the colourful and fun exhibits in Kaleidoscope.